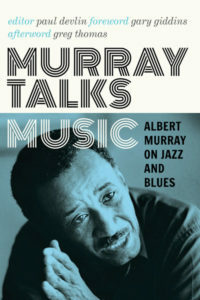 From Murray Talks Music: Albert Murray on Jazz and Blues by Albert Murray, edited by Paul Devlin (University of Minnesota Press, 2016). Used by permission of the publisher. Copyright 2016 by the Regents of the University of Minnesota. All rights reserved. In April 1994 Wynton Marsalis interviewed Albert Murray on tape at Murray’s apartment. Marsalis was and is one of Murray’s most careful and serious students. They first met circa 1981. Since 1987 they had been working closely together, along with Stanley Crouch and others, to establish Jazz at Lincoln Center and plan its programming. Marsalis’s deep knowledge of Murray’s thought leads him to frame questions that allow for Murray to answer their critics and critics of Jazz at Lincoln Center. Marsalis is acting as a sort of home-run derby pitcher here, serving up questions to which he already knows the answers in general outline, while encouraging Murray to swing for the fences with his answers. There is a certain polemical angle to the interview but, ultimately, more than two decades later, it has transcended many of the controversies of its moment (some of which take on perennial incarnations anyway), and rises to become perhaps Murray’s most comprehensive interview. Wynton Marsalis: Mr. Murray, I know you often make the distinction between the blues as such and the blues as music. Now, this is something that a lot of times is not understood. I know for myself that I really didn’t understand it. I thought that if you played blues it meant you had to be sad or you had to pay some dues, so I’d run outside looking for a car to run over my feet, or look to get shot or stabbed or something so I’d pay enough dues to be able to play something with some feeling. But after I met you and had the opportunity to come into contact with your philosophy, it really illuminated for me what the objectives of blues musicians are. Albert Murray: Well, the objective of the blues musician is to get rid of the blues; is to stomp the blues and of course you stomp the blues not with utmost violence but with elegance. The more elegant you can be, the more effective you’ll be at getting rid of the blues. Because it’s a matter of having the blues on the one hand; that is, feeling despondent, feeling sad, feeling melancholy, feeling defeated, feeling out of it. That’s having the blues, that’s having the blues as such. Whereas blues music has to do with playing the blues. It’s the right word for music because music is an art form. You can’t get to art in any reenactment — you have a ritual, you can have religious reenactment and so forth, but when you get to the playful reenactment, you’re on your way to fine art, and that’s the most effective way of dealing with the basic existential problems of human consciousness, and good feeling. Now, when you say reenactment, what exactly do you mean? Well, that brings us to the natural history of art, or aesthetic statement. Underneath all art is the reenactment or the repetition of the basic survival techniques of a given group of people in a given place, time, and circumstance. When they go over that, when they practice it, we call that ritual. You see? From ritual you get a mind-set which helps you to continue. You build up a pattern which adds up to what you’re conscious of, which adds up to your perception of reality. Now, this is so important to people that some cultures have that reenactment, or that repetition, or that rehearsal — it’s like rehearsing the survival technology, the food-getting or life-saving technology. It’s so important that they have it supervised! When you supervise it very carefully it becomes a religion. You see? But they also reenact it by playing around with it — and that is when we are on our way to art. Because play, although it may be supervised too, leaves a lot of space there. It really has tolerance; it really has a little play in the repetition of what you’re doing. Although you have a referee, or judge, or umpire — in certain games — and certain games have rules that are supervised and some have not, there is always room for individual options as to how you would repeat this. And it’s that type of playing around with the options that leads us to art. And it’s out of that particular basic human activity that art comes. Albert Murray (c. 1970). © Estate of Albert Murray. So you’re saying that blues music comes out of this desire to affirm things in cultures and to repeat, rather than hang out in the bar and grill on Friday and Saturday night with a beer in your hand and recount the woes of how your old lady treated you. What you’re saying is that actually that might be one part of the blues but that isn’t an attempt to deal with these situations. Well, we can reduce it. You wake up in the morning and realize that if you really look hard at what some of your possibilities are, life is a low-down dirty shame that shouldn’t happen to a dog. You could either cut your throat right then and get it over with, or you could try to pull yourself together to be ready to stomp at the Savoy by 9:30. What is likely to help you to do that? Not money, power, all those things. Getting your head straight will help you to do that. And that’s what the function of all art is. And of course, blues is an art form, and that’s what it can do for you. It keeps you from giving in to the melancholy, or the sense of defeat, or the sense of uselessness that you have. You get it together so that you really want to do something elegant yourself. You’re inspired to dance, to get with it, to get it on, to be yourself, to be with somebody else. You see? But the other thing about that, you know, is that the blues lyrics spell out a tale of woe, and the music counterstates it. “She’s lean, mean, and ugly, and got three left feet, but I love her just the same.” So the contingencies of romance are always being dealt with. You’re spelling out the negative aspects not just to wallow in the negative aspects but in order to realize what you have to confront in order to survive. You don’t kid yourself about the fact that life is rough, and you accept that life is rough — that means you accept the necessity for struggle, and that makes you stronger. That means you would probably tell a younger musician or the person who’s interested in playing or listening to the blues or enjoying the blues that you don’t have to create a situation where your wife has to leave you, or where you get shot or something, to get in step with the blues idiom statement. That’s a very big fallacy in dealing with art. You see, art is a matter of mastering the devices of expression. Just because you suffer doesn’t make you an artist. It’s the mastery of the means of expression that makes you an artist. People say, well, Bessie Smith sang the blues because she suffered and this and that. Why is she always suffering in the twelve-bar chorus? You know what I mean? [laughter] Twelve- bar chorus, eight-bar chorus, four bars. Art is a stylization of raw experience. It is not like cinema verité or something like that. It’s how you stylize it into aesthetic statement. We could say that art is a means by which you process raw experience into aesthetic statement. Then, when you get the aesthetic statement, that feeds back into general human consciousness and raises their level of perception of their possibility in the face of adversity. 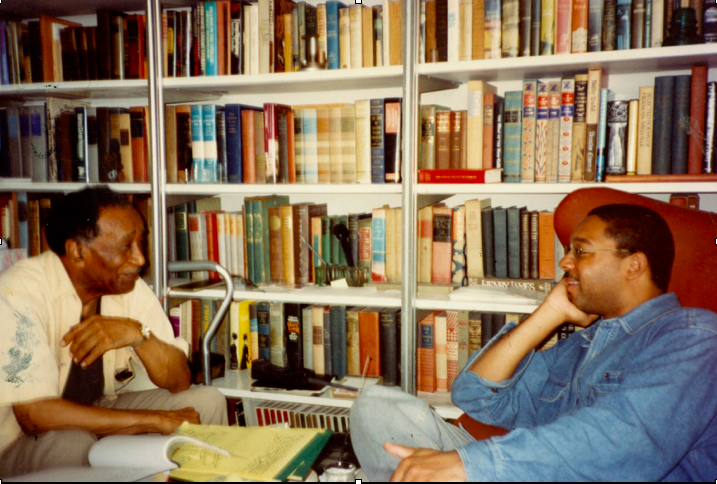 Albert Murray and Wynton Marsalis enjoy a conversation in Murray’s apartment (c. 1993). © Estate of Albert Murray. That leads us to a discussion of the form of the blues and the importance of form in art in general. Because in the twentieth-century discussion of art there is always the question of form. Is a work of art just the fact that you’ve done it, or are there some objectives, some things that you are trying to achieve, some standard by which things can be measured or judged? And if there is a standard, or a primary objective, things that are quantifiable, what are these things in blues music statement? Well, you know, one of the basic fallacies with so much twentieth-century art journalism is that they confuse art with rebellion and revolution. Art is really about security. The enemy is entropy, the enemy is formlessness. Art is about form. Art is about elegant form. If you’re going to be just for tearing down something, that is as ridiculous as trying to embrace entropy, then you’re gonna embrace chaos. If you want to try that, go down to the waterfront and try to embrace some waves coming in. You’ll do much better trying to surf on the waves. You’ve gotta be elegant to surf. You go out there and hug those breakers coming in, that would be exactly the same thing as hugging a monster from the depths of the earth, or hugging a dragon and whatnot. They are always defeated by what Thomas Mann calls “life’s delicate child.” And man prevails through his style, through his elegance, through his control of forces. Not through his power, but through his control. People who confuse art with attack forget that what art is mainly concerned about is with form, and adequate form, and the artist is the first to know when a form is no longer as serviceable as it was. You see? And that’s what innovation is about. He’s trying to keep that form going and he finds it necessary to extend, elaborate it, and refine it; to adjust it to new situations. That’s what innovation is about. It’s not to get rid of something simply to be getting rid of it, or to turn something around. It’s to continue something that is indispensable. Paul Devlin, Ph.D., is the editor of Murray Talks Music. He transcribed all of the interviews in the book. Wynton Marsalis is the managing and artistic director of Jazz at Lincoln Center and a world-renowned trumpeter and composer. 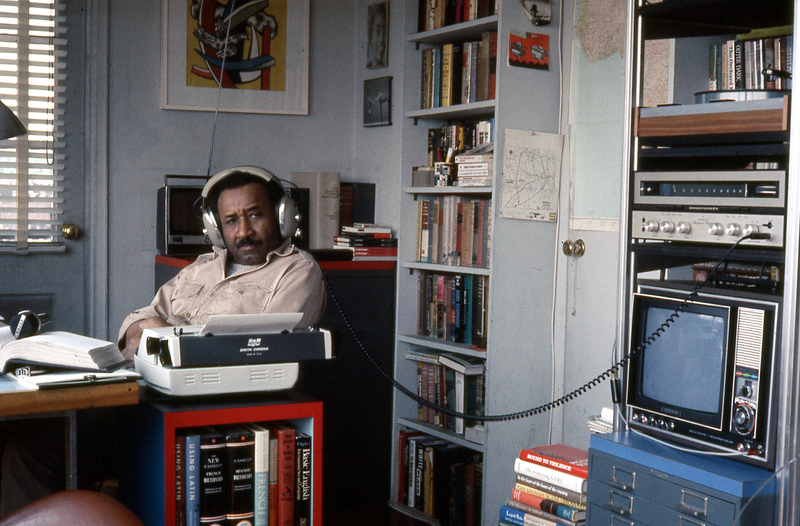 Albert Murray (1916-2013), a novelist, essayist, and poet, was the author of twelve books, published from 1970-2005. He was raised on the outskirts of Mobile, Alabama, and after a career in the Air Force, lived in Harlem from 1962 on.